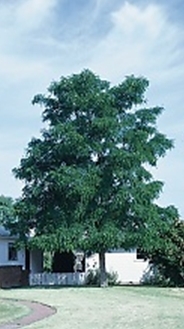 Grows to 75 feet in height with a spread of 20 to 35 feet at maturity. Open green foliage with fragrant white pea-like pendulous flowers in early June. Grows in poor, sterile and dry soils. For this reason it has been used for erosion control. Improves the soil with nitrogen-fixing bacteria found in nodules on the roots. Planted extensively for use as fence posts and firewood. Wood swells or contracts very little with moisture changes. Valued also as an ornamental. Excellent firewood. Small thorns when young. No shipments to MA.